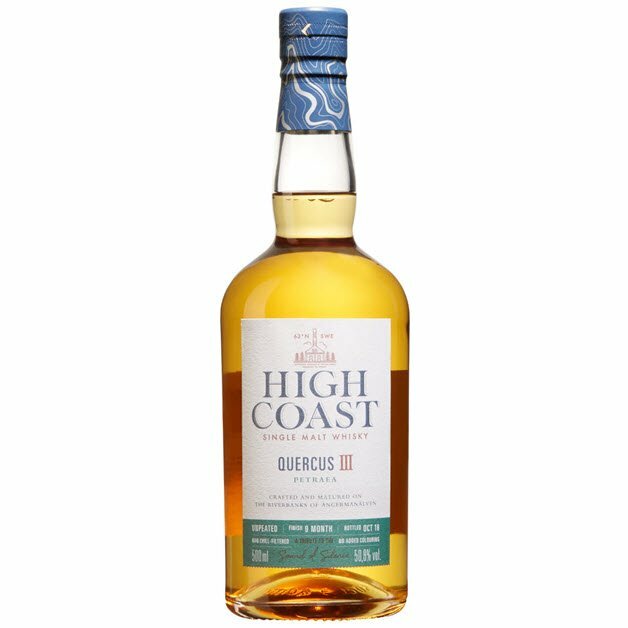 High Coast Quercus III - Petraea is an unpeated whisky that has been matured in 200 litre bourbon casks for almost five years and then finished for 10 months in 40 litre virgin Hungarian oak (Q. petraea) casks. It was distilled in the period 2013-03-15 to 2013-04-29, and bottled on 2018-11-23 and 2018-11-26. The total outturn was 7781 bottles (50 cl). I have previously reviewed the Quercus I Robur and the Quercus II Alba. The High Coast Quercus III - Petraea is readily available in Sweden at SEK 799 (4035902). Nose: Bonfire warmed marshmallows, sun-baked oak, and a touch of herbs. That was the initial sniff. With more time in the glass I detect cooler notes of freshly diced orchard fruits, chocolate éclairs, almonds and runny honey. Funny and slightly weird spicy notes appear from time to time - courtesy of the Hungarian oak, no doubt. Taste: Rich and full-bodied. Black and white pepper mixed with sticky, floral honey. Green apples and pears with a light coating of icing sugar. Again a green touch, more pronounced now than on the nose - mint, cloves and tomato plant. Finish: Medium to long finish. A touch oaky now, but not too much. Remains spicy, balanced with rich honey sweetness and green top notes. Comments: Hungarian oak is a funny oak. It can be, sort of, all over the place. This can be good, when kept at a moderate level (as in this whisky) or it can be a tad too much (as seen in several private cask bottlings I've tried). This is a great dram. Perhaps not easily recognizable as a High Coast whisky, but who cares as long as it's this good.